Washington senior Hannah Haithcock (30) goes up for the block, along with junior Halli Wall during the home-opener for the Lady Lions against the Southeastern Panthers of Ross County Thursday, Aug. 23, 2018. 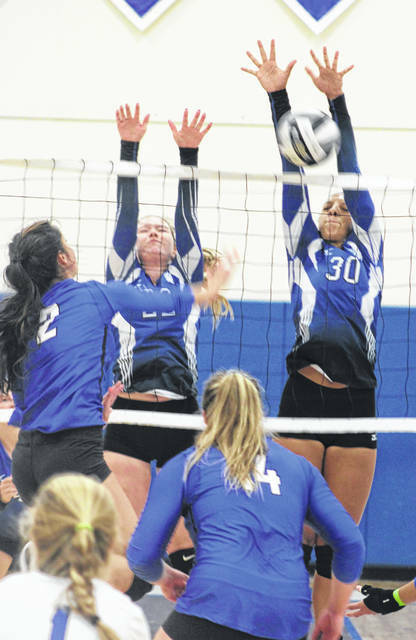 The Washington Lady Blue Lion volleyball team held its 2018 home-opening match against the Southeastern Panthers of Ross County Thursday evening. Southeastern won the match in three sets, 25-18, 25-17 and 25-9. One of the key words to describe Southeastern would be aggressive. “Since I started coaching at Southeastern four years ago, the plan was to serve aggressive, take (the opponent) out of their system,” Southeastern head coach Jimmy Hutton said. “We have five seniors on our team. We went to the Regional finals last year. We took second in the (Scioto Valley Conference) last year. Two years before that we were in the Sweet 16. “Southeastern is a really strong team,” Washington head coach Ashley DeAtley said. “They’ve been known to have a good defense and are able to get a lot of things up. “One of the things we did well, in the first and second games, we kept some pressure on them,” DeAtley said. “However, we had a lot of missed opportunities. They would miss a serve and then we would miss our serve. We didn’t capitalize the way we needed to. “We had to make some adjustments in the third (set) and it just had our girls a little off,” DeAtley said. “(Southeastern) did a nice job of finding our holes where we were struggling to get into the defense. They did a nice job tonight. Statistically for Washington, Hannah Haithcock had seven kills, Rayana Burns had six kills, Maddy Jenkins and Halli Wall each had three kills. Aaralyne Estep led Washington with 10 digs; Tabby Woods had nine, Wall had six and Haithcock had four. With ace serves, Haithcock, Wall and Mackenzie Truex each had one. In the j-v match Thursday, Washington improved to 2-0 with a 2-1 win over Southeastern. Scores of the match were 30-28, 15-25 and 25-18. Southeastern (1-0) is at home Saturday to play Portsmouth Clay and Nelsonville-York. Washington (1-1) will host former SCOL opponent Wilmington Saturday, with the j-v match up first at 10 a.m. The Lady Lions will have Frontier Athletic Conference matches Tuesday at Hillsboro and at home Thursday against defending FAC champions Chillicothe. J-v matches start at 5:30 p.m. during the week.